Charles Tyldesley is a Classics graduate from the University of Exeter. He is currently completing a PGCE from the University of Buckingham. Mr Tyldesley has begun teaching Latin, Greek, English and Music this year (2011.) He also assists Mr Crawford with the College's Scout Troop, coaches soccer and teaches the flute. Mr Tyldesley is assistant Choir Master and a Fellow of the College. 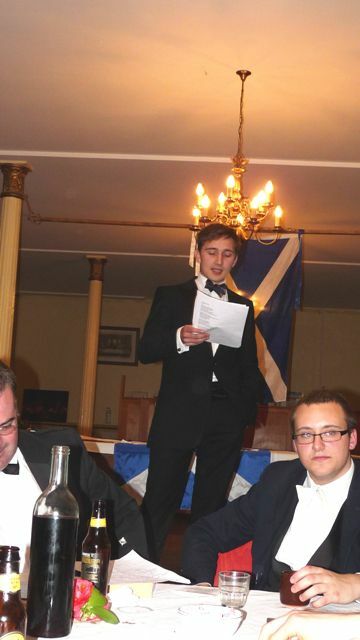 Traditionally for Burns Night, a man made a speech on women through and conversely, a woman made a speech on through men. But then, at the last moment the woman was canceled too, is teacher Tyldesley who held the role of women. A WOMAN ? Are you sure ?